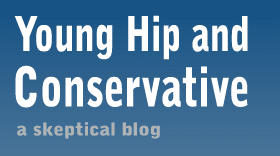 Young, Hip and Conservative: a skeptical blog: How clean are local farms? The New York Times did a piece on "local" milk production group Maine's Only Organic this week and I saw something I haven't seen in most of these small farm stories. 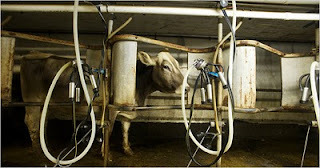 In particular, I'm referring to this photo of a cow in a milking parlor. 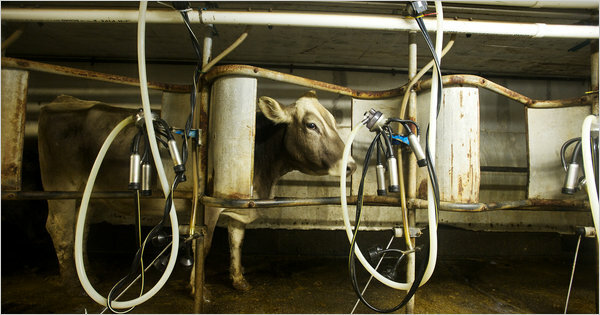 See the dirty, rusted equipment and excrement-splattered hooves? That's what a small farm looks like, at least the ones in New England I've seen. My 4-H dairy club used to tour New England and upstate New York farms once a year and I've seen a lot of grimy animals eating barrels of surplus chocolate bars in run-down buildings. The clean straw beds and cute red barns the locavores always conjure up are an alien concept to me. I've wondered if maybe this local purchasing push has encouraged farms to get a makeover, and I'm sure some have, but this photo really captures the smeared concrete floors and crusty legs I saw in the 1990's. To be clear, I'm not saying that small farms are dirtier than large farms - I suspect most of them are, but I honestly don't know. What I am saying is that food snobs like to show pictures of large farms and compare them to a fictional bleached and combed small farm that doesn't exist. Farms are naturally dirty. Heavy machinery is used just to move animal waste around inside the farm. Drive by one of these places and you will quickly experience "negative externalities." I remember one time as a reporter the entire downtown area where my office was located smelled like an open sewer for several days. We found out a local farmer had spread chicken waste on his nearby field as fertilizer. Keep that in mind next time someone suggests small farms belong in your community. By the way, back to the story and MOO - it's really not local milk anymore when you're selling it two states away in Massachusetts. Wait... how did this one slip by me? Red barns, clean cows, green pastures - you see that on the packaging of food from large industrial farms as well. Local farms are no more guilty of it than large corporations advertising their wares. That doesn't make it any more honest for either of them, though. I agree Jeremy. That's a good point - that advertising always plays off those images. My point was that the local farms don't look like that either.